Day 1 – finished thoughts. I had a friend of mine comment yesterday with two, very insightful thoughts on truly following wherever Jesus may lead us. The first was the idea that we tend to limit God because we are unwilling to take risks, to dream big or maybe it’s because we’ve never really accepted the promise that God really does want what is best for us, “plans for us to prosper”. This doesn’t necessarily mean financially. It could but to only think of that verse in terms of prospering financially, again limits the ways that God could help us “prosper”. The second thought, which I completely overlooked, was the idea of – in all things be thankful. Eucharisto. No matter my circumstance, I am and should be thankful for wherever I may find myself. This can be extremely difficult depending on the situation we may find ourselves. Speaking for myself here, I tend to never really express my gratitude for the countless blessings God has given me over the course of my life. Even through the worst moments of my journey, when I reflect on where I came from and what I’ve been through, I’ve experienced first hand the countless times where God has blessed me financially, with strength, with wisdom, with stamina and yes, even with patience. I once again find myself in such a season where I truly don’t know where God is leading me and in my human nature, it is more than a little unnerving not knowing. However, through Christ, I know if obedient, He will lead me exactly to where I should be. Probably not known to a lot of people, I have been looking for employment since the first of the year. The circumstances which led me to this place are not important but rather the process of which I proceed forward is. The really great thing about this, is that God started preparing Lisa and I for this months in advance. In talking with each other we both had this sense that God was preparing us for a change. Whether that change was in physically moving or a job change, or both we weren’t sure but we knew things weren’t going to stay the same. The reason we knew this was because God has done this before in our lives. As we started thinking and praying about what was to come, we suddenly, out of the blue, learned that we would be coming into money. My first thought was how cool, now I can buy some things (toys), and maybe get some things done around the house that really need to get done. But fortunately my conscience (Lisa), prevailed in convincing me that maybe we should practice patience and sit tight with the money. A very wise woman, my wife and someone I never fail to be thankful for! God’s timing proved to be perfect again as the week before the check arrived we found out what the provision of money was to be used for, as I found out that I would soon be unemployed. God’s grace really is sufficient. I would be remiss if I didn’t also take this chance and express gratitude for Pastor Chuck and the rest of my family (church staff), for the love and support they have shown me and my family through this transition. It is rare to find yourself in this type of position and have nothing but respect, love and admiration for your former employer. But that is exactly how I feel about them. Their constant uplifting as served as a reminder that God is in control and I only need to be faithful to follow Him. So as I type this I still have no idea what is next for Lisa and I but I am thankful for the peace I have in this moment. 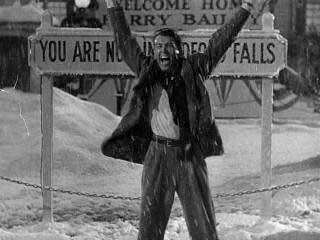 It’s cliché I know but honestly, I feel a little like Jimmy Stewart at the end of It’s A Wonderful Life. Not the very end where everything works out but at the moment where he understands how precious his life really is. At that moment, he doesn’t know how things will turn out, he only knows that he has a chance to live, to see and be with his family again. In that moment, he fully understands how blessed he is and is truly thankful for all he has. And just as he was to learn, we typically learn later how much more we are blessed than what we first realize. Standing in his living room, he finally understands that one of his greatest blessings are those relationships which surround him in love in his hour of greatest need.